Two families changed forever by a kidney donation met Thursday, one year after the life-changing gift. 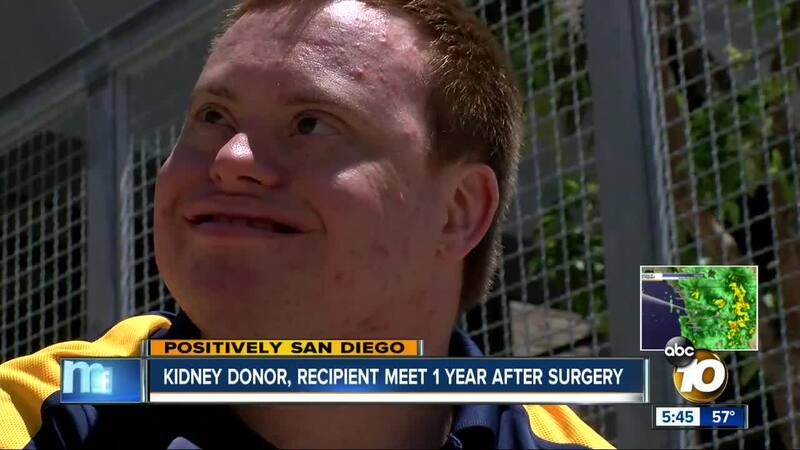 SAN DIEGO (KGTV) - Two families changed forever by a kidney donation met Thursday, one year after the life-changing gift. 10News first met James Wellman in 2017. His kidneys were down to 5 percent function. Wellman, who has autism and Down syndrome, was repeatedly rejected from the donor list. Paul Williams saw Williams’ story on 10News and decided to help. “I had begun praying some time ago, is there something that God wanted me to do to help somebody else out,” Williams said. Williams donated his kidney to Wellman in 2018. The families will now be connected. “Oh, it’s wonderful seeing that James is doing so well and everything is good, so good,” said Williams. Wellman is now in good health, enjoying swimming and art classes. The families said they plan to start a tradition and meet every year on the anniversary of the transplant surgery to celebrate.